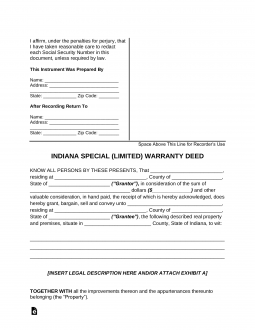 The Indiana special warranty deed is similar to a warranty deed in that it provides some measure of guaranteeing title, however, it only provides a limited guarantee. The guarantee is limited to the grantor’s ownership of the property and not any previous ownership. As with all cases of property transfer, it is vitally important that a thorough property search is conducted to determine whether the grantor has a clear title or whether there are other interests still tied to the property such as an undischarged mortgage or a hidden right of way. Step 1 – Write in the name of the grantor(s) or seller(s). Step 2 – Include the seller’s street address and the marital status. Step 3 – Fill in the amount paid for the property with both numbers and words. Step 4 – Write in how the grantee or buyer will hold the property. Step 5 – Include both the street address of the property as well as the legal description of the property. Step 6 – Write in any easements or restrictions. Step 7 – Fill in the deed information for the previous transfer of the property. Step 8 – Sign and date in front of a notary public. Step 9 – The grantee will have the original filed with the county recorder.